…make a decision and make it early. Hopefully it’s the right decision, but having no decision is a disaster. 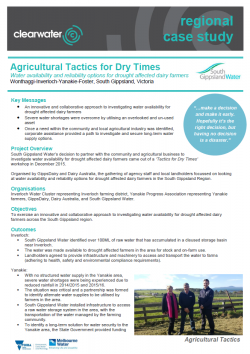 South Gippsland Water’s decision to partner with the community and agricultural business to investigate water availability for drought affected dairy farmers came out of a ‘Tactics for Dry Times’ workshop in December 2015. Organised by GippsDairy and Dairy Australia, the gathering of agency staff and local landholders focussed on looking at water availability and reliability options for drought affected dairy farmers in the South Gippsland Region. 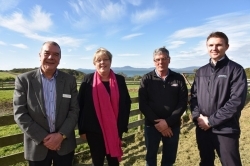 Inverloch Water Cluster representing Inverloch farming district, Yanakie Progress Association representing Yanakie farmers, GippsDairy, Dairy Australia, and South Gippsland Water.